One of my very best literary friends, Olugbemisola Rhuday-Perkovich, suggested I interview two of her fellow Brooklynite middle-grade novelists: Torrey Maldonado and Danette Vigilante. She said, “Their books should be each other’s first date.” She didn’t need to say more than that. I didn’t really know either one, though Danette has been kind enough to let me pretend to be one of her cousins after I noted that 836 cousins seemed to chime in their congratulations and support whenever she posted good news on Facebook. She promptly invited me to be a cyber cousin, too. And a visit to Torrey’s website and some introductory exchanges made a big fan out of me. I asked them some questions and got to know them a bit more through their responses. Now it’s your turn. Can you explain your connection, which goes back a generation? How would you describe your friendship now? DV: Torrey’s mom and her family lived across the street from my father and his family when they were kids. My mother also went to school with one of Torrey’s aunts. Our families are still living in Red Hook and see each other every now and then. Even though Torrey and I don’t see one another that often, our friendship is very comfortable. We come from the same place and share a great bond. We know the same things and I’m guessing, have the same feelings about certain things. Red Hook was a pretty tough place and we were both lucky enough to avoid some of the difficulties that faced our beloved neighborhood. In many middle-grade books, setting is peripheral. In both your books, the living-in-the-projects setting is central. Can you talk about how growing up in Red Hook affected the books you ended up writing? DV: I remember a little boy from my childhood who reminded me of Corey, the boy Dellie sets out to help in THE TROUBLE WITH HALF A MOON. This little boy affected me so deeply; setting my story elsewhere just never occurred to me. It was kind of like having tunnel vision. Though I don’t mention the name of the Housing Project, in my head, Red Hook is where the story takes place. Come to think of it, Red Hook seems to be flowing in my veins. My next book, SAVING BABY DOE is also set there. This time, I do mention where it takes place and even briefly mention a couple of characters from TROUBLE, including Dellie! TM: From my birth to the 1980s, nearly everyone in the Red Hook projects was my family. People looked out for each other and I felt protected. Then drugs ripped Red Hook apart and, by 1988, LIFE magazine did a nine-page photo spread calling Red Hook the “crack capital” of the U.S.A. and one of the ten worst neighborhoods in NY. I needed real thrills to distract my young mind from the drama. Reading could’ve helped yet where I’m from female readers get called “geeks” and boys get called the other “g word” since people feel school is a “girl’s thing.” So I read what guys in my projects read to avoid being bullied–comic books–and I got hooked because they pumped me up the way sports, video games, and movies did. That influences my writing. I write to give kids the same rush as comic books, video games, and movies and my dream is coming true. During a school trip, students who hate to read approached me. One boy said, “Mr. T., I know one of the raps from your book by heart.” Then, he looked into the air and said a Black Bald’s rhyme so perfect that you’d think he read it from a cloud. My upbringing inspires me to write to get that reaction. Did you set out to write a middle-grade novel or did you discover the age of your main character in the writing? What made you want to write about a character at this age? DV: When I set out to write TROUBLE, I didn’t exactly know what it was I was writing. All I knew was that the little boy from my childhood broke my heart and I wanted to get his story out and give him a good life. It just so happens that Dellie was a brave thirteen-year-old girl willing to step in and help. Dellie does what I wish I had done as a kid. TM: As a middle-school student I could’ve taken different turns that would’ve driven my life over a waterfall to a terrible ending. In 1992 my elementary school principal (Patrick Daly) was shot and killed in my housing projects. Years later, I became the first person in my immediate family to go to college and, as a Vassar student, I ran into someone arrested for Daly’s murder in an upstate prison where I tutored. The inmate was a boy I ran wild with as a kid! I wrote SECRET SATURDAYS to let youth see that a lot influences their choices yet they can make better choices. Also, if we want better men, we must get more boys reading. Period. If Dellie got to choose a fictional character to hang out with, whom do you think she’d choose? Since Dellie is courageous, I’d love to have her choose Hermione from HARRY POTTER. She’s brave, kind and very smart. I think they’d make a great team! If Justin got to choose a fictional character to hang out with, whom do you think she’d choose? Hancock and Ironman. Justin is half-Black and half-Puerto Rican like Carmelo Anthony (who was born and raised in my housing projects until he was eight). How Justin deals with being bi-racial is an important part of SECRET SATURDAYS. Hancock–the superhero played by Will Smith–has Justin’s complexion. Ironman has Justin’s Puerto-Rican American heritage. Since Justin’s surviving without a dad, they’d be welcome male presences. What do you think Dellie and Justin would think of each other? What advice might they give each other? DV: Since Justin and Dellie are both caring individuals and very much tuned into the world around them, I think they’d get along great. In fact so great, Michael, Dellie’s love interest, might get a run for his money! As for advice? Hmmm … Dellie would probably try to convince Justin that his friendship with Sean is definitely worth saving. I like the idea that if Justin and Dellie were good friends, he’d hold her hand as they crossed Bellmore Avenue (the place where her brother died one year earlier) giving her the strength she desperately needs. In doing so, his quiet advice to her would be that it’s okay to lean on others when you’re in need. That you don’t have to go it alone because when people care about you, they willingly help to lessen your load no matter how heavy it may be. Why did Danette, whose name starts with D, make her main character Dellie with a D? My mother almost named me Justin. Why did I name my main character that? Danette and I share something in common: our inner Dellie and Justin “made it” and still lives in us. Now, we use books to hook Red Hook kids and other youth to books to trampoline them to greater heights in life. I am so touched by those images of Justin and Dellie holding hands. Thank you both. Torry Maldonado graduated Vassar to train teachers and administrators to run conflict resolution programs. He approaches his tenth year as a public school teacher of history and is a novelist. SECRET SATURDAYS was named an American Library Association 2011 Quick Pick for Young Adults. It has been showcased on NBC, ABC, the NEW YORK DAILY NEWS, and more. A tale of friendship and tough choices, SECRET SATURDAYS unfolds through the changing relationship of Sean and Justin—best friends in the tough neighborhood of Red Hook Projects in Brooklyn. Sean’s changing, his grades slips, and he acts up. It all has something to do with a secret that happens on Saturday. What’s his deal? How does his best friend handle his lies and his acting strange? Learn more about Torrey and his debut novel at his website. 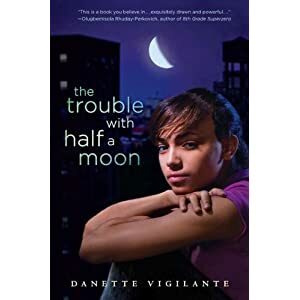 Danette Vigilante grew up in the Red Hook Housing Projects in Brooklyn, New York. She currently lives in Staten Island with her husband, two daughters, two cutie patootie puppies and one evil cat. Danette insists on singing to her pets even though they’ve asked her not to. Danette also writes a monthly column for the RED HOOK STAR REVUE. Her next novel, SAVING BABY DOE (Putnam 2012), is about two friends, Lionel and Anisa, whose friendship becomes strained after finding an abandoned baby in a Port-O-Potty at a construction site. Learn more about Danette and her book by visiting her website. This entry was posted in Uncategorized and tagged Carmelo Anthony, Danette Vigilante, Hancock, Hermione, housing projects, Ironman, middle-grade fiction, Olugbemisola Rhuday-Perkovich, Red Hook, Saving Baby Doe, Secret Saturdays, teen novel, The Trouble with Half a Moon, Torrey Maldonado, urban novel, Vassar. Bookmark the permalink. Loved this interview. The voices of the wonderful authors themselves really shine through. And I just love the concept of the entire blog: Literary Friendships!